Artists Julia Whitney Barnes and Ruth Hofheimer unveil their community organized project on the canal-facing wall of Dykes Lumber, creating a new vista from Whole Foods. 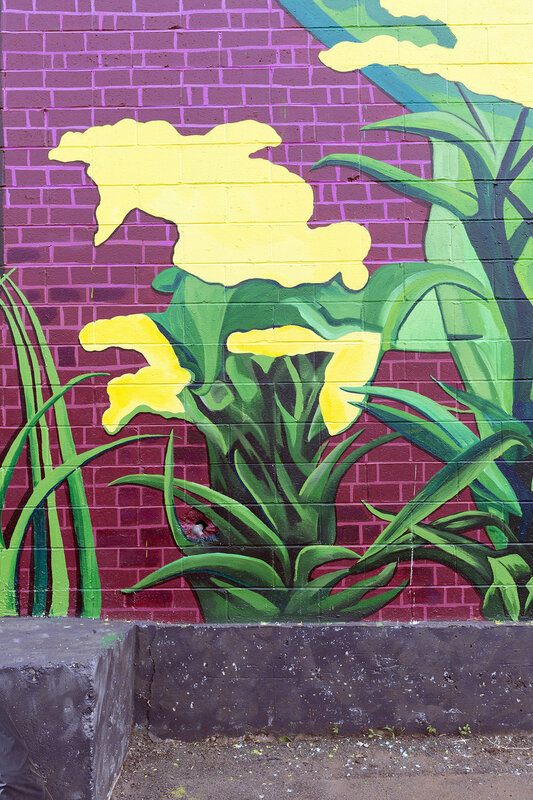 BROOKLYN, August 17, 2015 – Arts Gowanus and the Old Stone House & Washington Park are pleased to announce the unveiling of a large scale mural project by artists Julia Whitney Barnes and Ruth Hofheimer on the canal facing wall of the Dykes Lumber building, the first piece of a larger Gowanus Public Art Project underwritten by New York Councilmember Brad Lander, with support from Arts Gowanus and the Old Stone House & Washington Park. The unveiling will take place on Thursday, August 20, from 6 pm – 8 pm in the Whole Foods Park on Third Avenue and 3rd Street in Gowanus/Brooklyn. 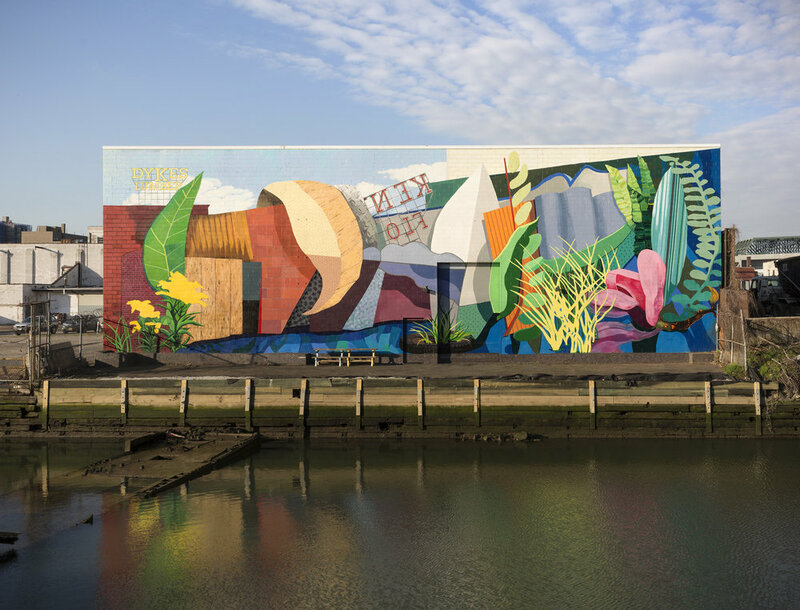 The mural, which can be seen in full from Whole Foods, aims to connect its urban audience to nature in the Gowanus through the use of organic forms native to the area. This artistic intention parallels the environment work of the Gowanus Canal Conservancy, which provided invaluable volunteer support to complete the project. Other inspiration is drawn from the mixed use industrial landscape of the Gowanus neighborhood, as well as the canals and floating gardens of Xochimilco in Mexico City, and Patricia Johanson’s functional eco-art. Other projects in this participatory public art series that will engage numerous artists, youth, and community residents in the creation of 6 public artworks over the next 12 months include a photo mural on 8th Street by photographer Joe Cantor; an outdoor Art Lab by the Gowanus Canal Conservancy; a traffic safety education mural by Groundswell at 138 5th Avenue; a parklet at Ennis Playground by Michael Clyde Johnson; a mural by Miquel Del Real at the 19th Street overpass; and The Keepers, a performance art piece by Ed Woodham. Underwritten by a total of $35,000 in funding from Councilmember Brad Lander, this series aims to create new platforms for public art and new opportunities for the artists, while at the same time showcasing what makes Gowanus “Gowanus”: the history, the Canal, the culture of creativity and the diversity of the community. Known for its industrial past and polluted canal, Gowanus is now home to hundreds of artists and creative businesses. Julia Whitney Barnes is a multi-disciplinary artist who makes indoor and outdoor works related to the natural world. Ecological practices and the complex relationship humans have with the environment influence her work. Shown nationally and internationally, Julia has created site specific works in numerous venues. Julia is a Vermont native, long-time Brooklyn transplant, and since 2006 her studio has been in Gowanus. Ruth Hofheimer is an artist engaged in public art, community organizing and urban environmentalism. 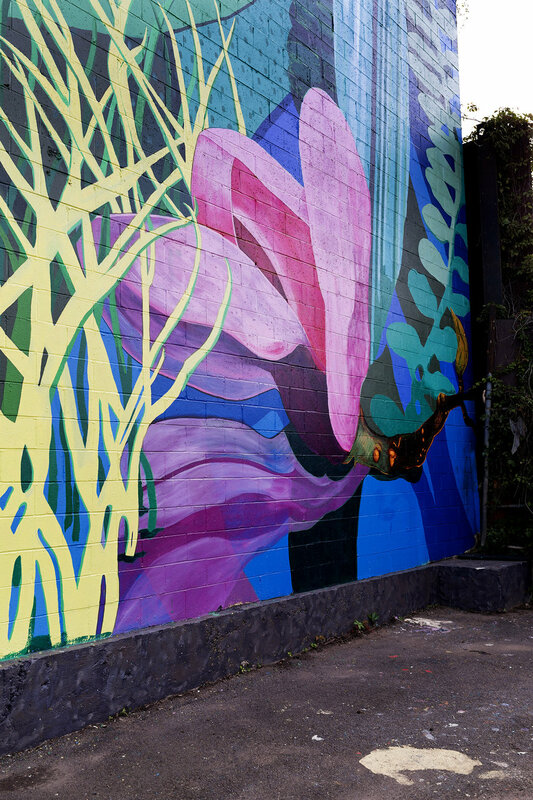 She believes in the power of beautiful and engaging public spaces to build stronger communities and has partnered with public organizations, non-profits, schools and community groups in New York City to create a number of large-scale murals and sculptures. Over the past three years Ruth has worked in various capacities with a number of Gowanus non-profits including Arts Gowanus, The Gowanus Canal Conservancy, Build It Green! NYC and Groundswell. She is also an architectural designer and is connected through this work to numerous businesses in the area including a longstanding relationship with Dyke’s Gowanus. Arts Gowanus supports artists and artmaking, builds bridges between arts and the community, and works to ensure that the Gowanus neighborhood continues to nurture artists. Brad Lander has represented Brooklyn’s 39th District since 2009, and is a leader on issues of affordable housing, livable communities, the environment and public education. He is committed to the Gowanus as a cultural community. The Old Stone House is an active cultural site and presenting organization dedicated to creating a strong sense of community through history, environmental education and the arts. Eagles dominate the raptor family in evolution and symbolism. Once endangered, they have recently made a historic resurgence, flourishing in the wild and recently returning to New York City after a lengthy hiatus. Their ubiquitous presence on our federal buildings and currency heralds the bravery and strength we identify as inherently American. Facing extinction in the middle of the twentieth century, Peregrine falcons are again flourishing in our metropolis. Native cliff dwellers, their graceful ferocity is distinctly suited to the vertical canyons of New York City. Their graceful resilience in our urbanity is a symbol of our own determination and courage. The Great Horned Owl’s large eyes and steady presence project wisdom and patience. 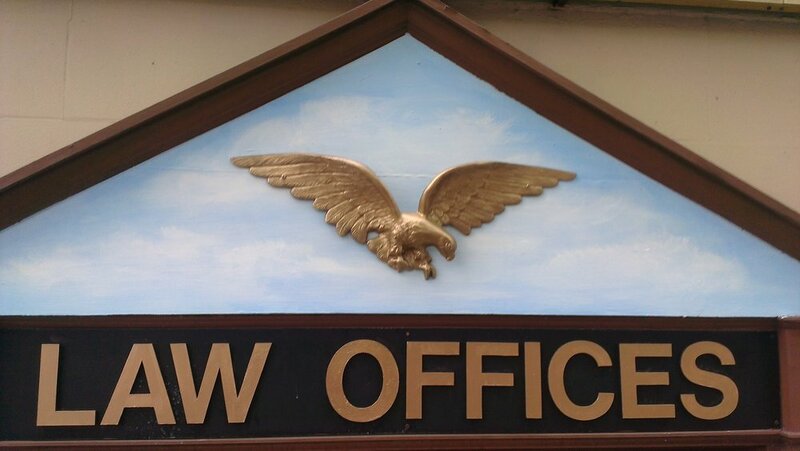 The Owl’s conservation of motion and grandeur in attack combine for an enduring symbol of jurisprudence and scholarship. 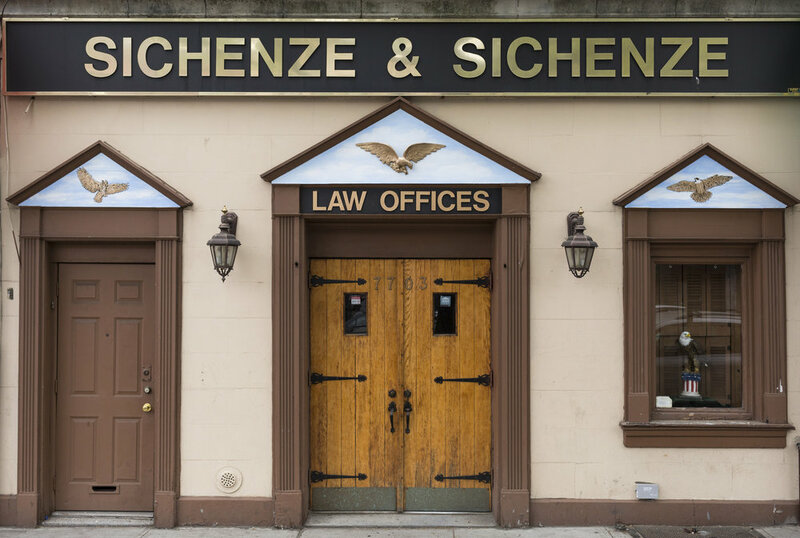 Placed above the doorways and windows of Sichenze & Sichenze, the center perch is occupied by a sculpted Eagle, originally purchased and installed by Andrew Sichenze. 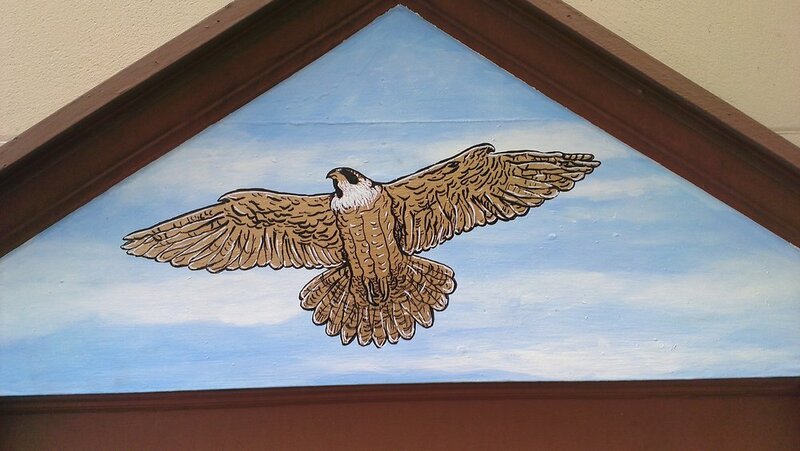 My intervention iinvolved painting a sky in each pediment, repainting the center eagle, to the viewer’s right the painted Falcon, and to the left, the painted Owl, all executed in gold.